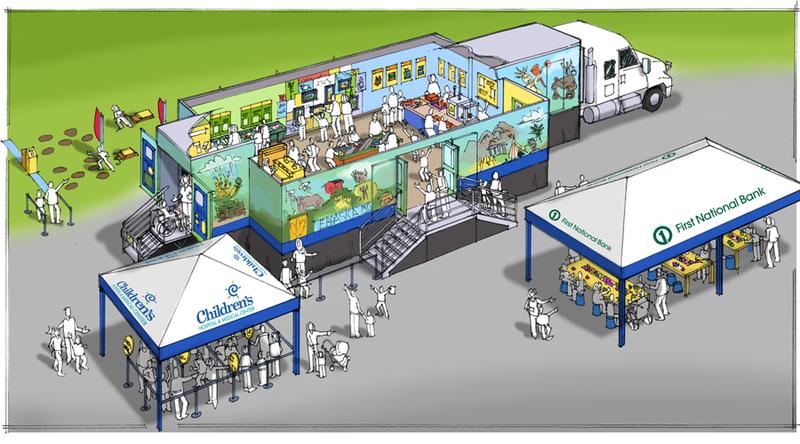 A Mobile Children’s Museum will be stopping in Columbus September 14th-16th. The museum was created for the Nebraska 150 Celebration and is the event’s largest project. Interior exhibits will include areas where kids will build shelters and test them in a wind chamber or earthquake simulator, design their own 10-acre homestead, test their knowledge of Nebraska, create a movie, explore toys from the past and craft their own postcards. Exhibits will also surround the exterior of the trailer, allowing for optimal play and learning space, organizers said. These exhibits will include a timed “chore” challenge obstacle course, foam block invention area and toy creation station. The mobile museum is sponsored in part by Children’s Hospital, First National Bank, Peter Kiewit Foundation, BNSF, Associated General Contractors of America — Nebraska Chapter, AGC Nebraska Building Chapter, TransCanada and Nebraska Educational Savings Trust. Exhibits in the museum are intended for children ages 5-12, but audiences of all ages are welcome. Admittance is free and open to the public.